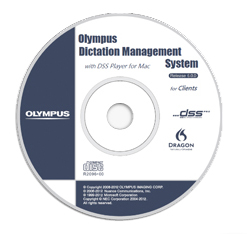 Olympus Dictation Management System (ODMS) software is an integrated software system designed to increase efficiency in the dictation and transcription workflow. By using ODMS, authors and transcriptionists can effectively manage and share dictation files and documents. ODMS consists of multiple modules, each specifically designed to cater to the needs of different users. Authors, transcriptionists and system administrators can each utilize their respective modules to carry out tasks and manage their dictation workflow. The administration modules are only available in the ODMS Workgroup Mode and will be supplied on a separate CD and respective license numbers. The dictation & transcription modules for clients are available in both Workgroup and Standalone modes. They are supplied on a CD, and a license included with the device or transcription kit. DICTATION MODULE: ODMS R6 Dictation software is supplied with DS-7000/DS-3500. This is used for downloading dictation files, configuring the device and transcribing files with the voice recognition features. TRANSCRIPTION MODULE: ODMS R6 Transcription software is supplied with the AS-7000 transcription kit. This module is used for transcribing documents, managing dictations and correcting documents using the voice recognition features. FILE DOWNLOADER: A small client-side module used for automatically downloading dictations from supported Olympus devices. No License is required to use this software. This module does not have voice recognition or playback features. ADMINISTRATOR CD CONTENTS: The ODMS Administration CD contains all of the tools required to install, customize, and manage an ODMS environment in Workgroup mode. The software is supplied separately and is a required component of an ODMS Workgroup mode environment.